The ranking is computed by taking into account the averages of various affordability rates, median home prices, sales prices in major markets and where home prices are expected to rise. According to the Forbes.com article "Nationally, homes are near the most affordable they've been in 18 years." 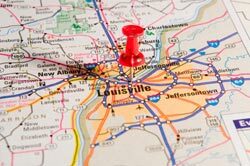 Since Louisville homes are looking strong on the housing market front, there should be no fear in those who wish to upgrade their homes or those who are wanting to move into the area. There are many resources here on this site to help you find your perfect home and to help you find the best agent to work for you. The River Valley Group is always available to help you sell your home or buy your next one! Don't let the housing market scare you- Louisville is still growing! Ranked as the "2nd Best Housing Market in the United States" by Forbes Magazine.